I do like a good chocolate brownie. Squidgy, rich and decadent. I am lucky in that Mrs Chillikebab makes what are undoubtedly the Best Chocolate Brownies in the World. A big claim, yes, but a justified one, I think – and I’ve yet to meet anyone who, having tried them, disagrees. The key is, of course, to use the best quality chocolate you can get your hands on, and to undercook them. Or rather, not to undercook them, but cook them just perfectly – which means taking them out of the oven far earlier than your instincts (and often the recipe) tells you, so they finish cooking and firming up in the pan before you turn them out in all their squidgy glory. I’ve never had an Adriano Zumbo brownie, but I presume he can make a half-decent one, given people seem to queue around the block just to get into his store. And it is this that forms the basis of the final Zumbo Tim Tams – the others being Raspberry White Choc and Salted Caramel. Those of you who read the Raspberry White Choc review may be getting nervous at this point, as the dreaded ‘choc’ rears it head again. Normally this means nasty chocolate substitute in place of the real thing. You’ll be pleased to know that in this case the name is misleading – there is real chocolate aplenty in these Tim Tams. Why they didn’t call them ‘Chocolate Brownie’ I don’t know. Maybe the shorter name is how Adriano Zumbo refers to them in his store, in some kind of post-modern ironic manner. They present pretty much like a regular Tim Tam. However, they are somewhat different on the palate; the chocolate cream is much darker and richer, and generally has a more chocolaty taste. They amazingly actually do capture something of the essence of a chocolate brownie; perhaps it’s a hint of vanilla, or the buttery richness. They are pretty good – I’d say the best of the Zumbo trio. I’m going to give these an eight of of ten. I like them. 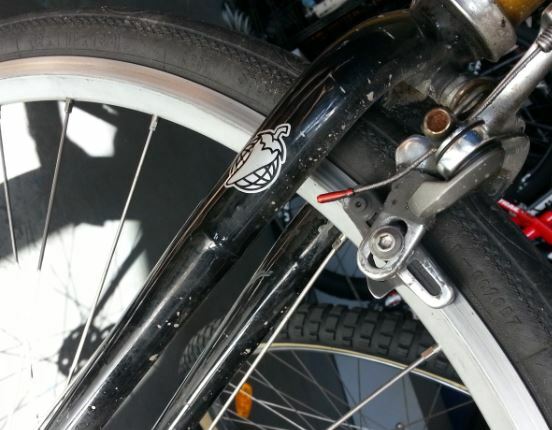 Yes, that is a massive crack in the front forks, just below the Salsa logo. (Here’s a close-up.) You might also see a matching one on the other side. The whole fork is literally in danger of folding up at any moment – and it’s going to fold up forward, not backward. Indeed, it’s not clear in this picture but you can actually see the bend in the forks. As humans, we revel in our ability to think. To judge. To see the world around us, to fathom its intricacies, to understand and communicate its nuances, and above all to be able to discern its truths. Except that we are deluded. We are actually pretty terrible at objectively weighing up the evidence around us, preferring to use a range of mental shortcuts to arrive at a ‘truth’ that is often utterly at odds with reality. Furthermore, once these ‘truths’ are lodged in our brains, we resolutely stick to them, ignoring all evidence to the contrary. The strength with which we cling to our beliefs is extraordinary, and in many cases we simply refuse to ever give them up, however ludicrous they may seem to an objective observer. This behaviour is familiar to everyone, of course. We are also rather good at spotting this behaviour in others, even as we are blind to our own delusions. 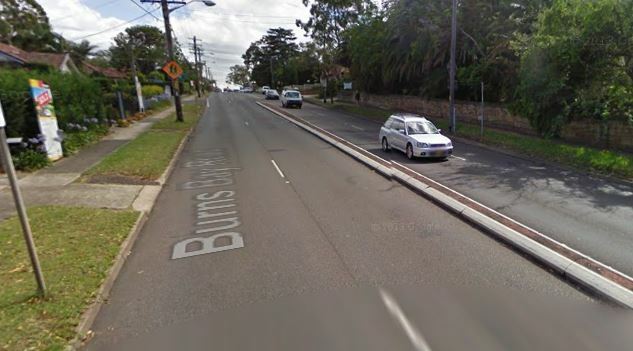 But why should this be so? Why do we cling to our beliefs? How are they formed? And why do certain topics – religion, politics, spirituality, – seem to be at the heart of so many powerful belief systems? 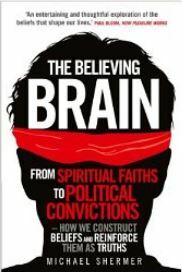 In this book Michael Shermer dissects the patterns, systems and neuroscience of belief, to explain how and why we get so caught up in our beliefs, and why the more they are challenged the more entrenched they become. He breaks this process down into two broad categories – patternicity, or the tendency humans have to see patterns in everything, even when none are present; and agenticity, the tendency we have to ascribe an outside purpose to random events. He also explores the nature of objective truth and how to arrive at it; the power of sceptical thought and the scientific method. There are some fantastic observations and evidence. For example, he describes how easy it is to make mice and birds ‘superstitious’ – associating a food reward with some random, unrelated action. He then goes on to describe how trivial it is to get humans to do the same things; his accounts of otherwise perfectly normal, rational people doing weird dances, or touching every wall before hitting a button because they think it might influence the number of ‘points’ they score is both hilarious and somewhat disturbing (the number of points they actually received, by the way, was completely random). Overall this is a good primer to the subject, and is for the most part well written – although there are sections than ramble on somewhat. He takes entertaining potshots at all sorts of institutions along the way, from faith healers to economists, from religion to political parties, and shows how they are slave to biased thinking. The book is not startlingly original and doesn’t have a great deal of new material for anyone reasonably versed in sceptical and scientific literature (think Dawkins, Harris, Grayling, Sagan etc). He amusingly also gets very caught up in his own US-centric libertarian political views which significantly colour the chapters on politics – apparently Shermer is not immune from the effects he describes. However, as an entertaining and well-written introduction to the subject it is to be recommended. Choc. Four letters to strike fear into the heart of the biscuit aficionado. Four little letters that spell ‘disappointment’. Because, you see, ‘choc’ is what legal eagles insist biscuit marketers write when the biscuit does not contain any chocolate, merely flavoured vegetable fat. But somehow ‘Raspberry & flavoured vegetable fat’ does not have the same ring to it. For all that, what are these new Tim Tams? 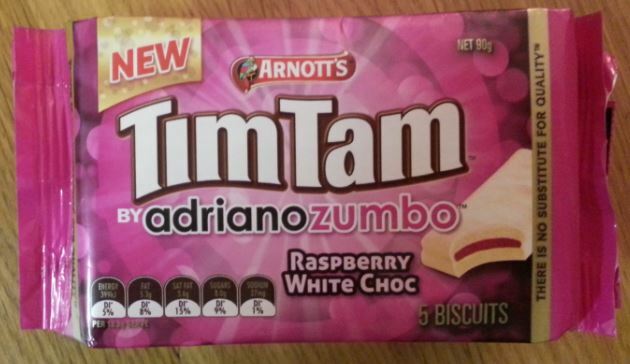 Well, they are another in the range ‘by Adriano Zumbo’, and consist of a white choc Tim Tam with the filling exchanged for a lurid red raspberry variety. And that filling really is lurid. I wondered if the pack artwork was exaggerated on this point, but if anything the actual biscuits feature an even brighter-hued interior than depicted, as if biting into them inflicts some kind of wound. So how do they taste? Well, I have to be honest and say ‘better than I expected’. 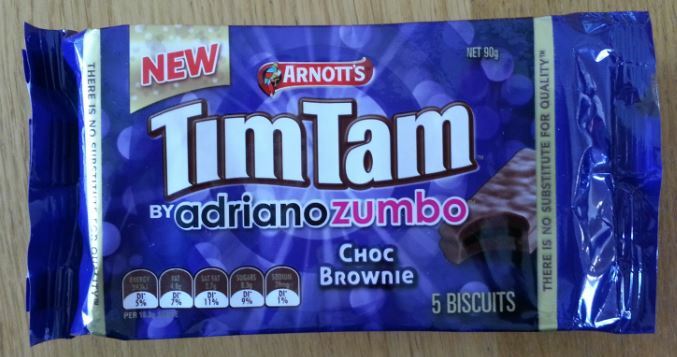 If Adriano Zumbo set out to improve the worst Tim Tam ever made, he succeeded brilliantly, as these are quite chompable. But if he set out to make something truly great, well, he failed. These are not bad; they pass the time and are not an embarrassment. But they are, at best, a mediocre example of the Tim Tam genre. I’m going to give these a six out of ten. *The exception that proves this rule is, of course, the Wagon Wheel, a glory of choc that defies all known science.